Last week, in this space, I detailed just what types of products you should be using to control insects and diseases in your garden. This week I have news about a BRAND NEW NATURAL CHEMICAL for the control of weeds in your lawn and garden ― particularly to control dandelions and plantain. The name of the new product is Wilson Lawn WeedOut Ultra. Wilson Lawn WeedOut Ultra contains the technical grade active ingredient 4-chloroindole-3-acetic acid, or 4-Cl-IAA, to control small patches or individual broad-leaved weeds as a spot treatment in turf. 4-Cl-IAA is a NATURAL WEED CONTROL PRODUCT that represents the legitimate next generation after three-way phenoxy turf herbicides, such as Killex. But, it DOES NOT contain the active ingredient 2,4-D.
Wilson Lawn WeedOut Ultra contains 4.5 grams per litre of 4-chloroindole-3-acetic acid ( 4-Cl-IAA ) present as potassium salt. There are several major positives to 4-Cl-IAA when compared with so-called green alternative pesticides, such as Fiesta. According to Health Canada, 4-chloroindole-3-acetic acid is a member of the chemical class of chlorinated derivatives of indole-3-acetic acid. It is a NATURALLY-OCCURRING PLANT HORMONE found in seeds of a variety of annual plants, and then is secreted from developing seeds into parent plants, triggering nutrient mobilization and translocation to seeds, followed by senescence of the parent plant. The herbicidal effect of 4-Cl-IAA was first reported in 1996. Symptoms and eventual death of weed-plants treated with 4-Cl-IAA are thought to be induced by abnormal levels of ethylene in tissues. 4-Cl-IAA is classified as a Group 4 herbicide according to the Weed Science Society of America ( WSSA ), and as a Group O herbicide according to Herbicide Resistance Action Committee ( HRAC ). 4-Cl-IAA is a « natural » ingredient, which means, for the first time, professional lawn care businesses can employ this term in their advertising campaigns. With 4-Cl-IAA, these businesses can freely use the term « natural » in their advertising. This active ingredient provides control in turf against ― dandelion and plantain. It also provides top growth control of ― black medick, cinquefoil, fall hawkbit, and hawkweed. Visible effects on weeds can be observed within 24 hours and weeds die in four to eight weeks when 4-Cl-IAA is applied. Avoid mowing turf until the visible effects of the 4-Cl-IAA treatment becomes visible. In some cases, top-growth is merely suppressed within a few days after application, but roots remain intact, which explains the rapid re-growth after an application of 4-Cl-IAA. 4-Cl-IAA products are used to control small patches or individual broad-leaved weeds as a spot treatment in turf. 4-Cl-IAA certainly can be a major effective component in a weed control program. To maximize its effectiveness, 4-Cl-IAA should be used in conjunction with a sound turf maintenance program. 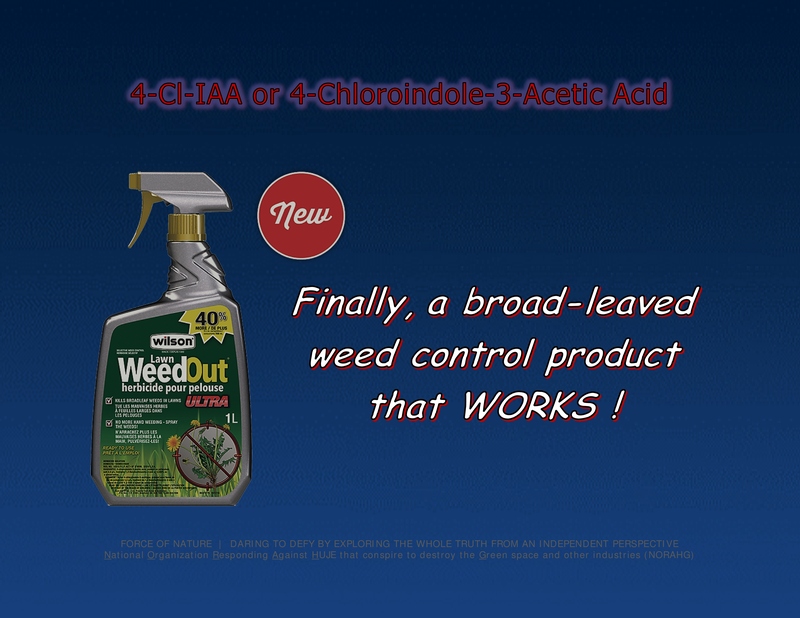 4-Cl-IAA can be used anytime on weeds that are actively growing. Applications of 4-Cl-IAA should be made to actively growing weeds, any time during the year. 4-Cl-IAA can be directly applied to small patches and individual broadleaf weeds as a spot treatment. For hard to kill weeds, re-apply after 4 to 6 weeks. This product will not prevent new weeds ― apply only when weeds are present. According to the product label of Wilson Lawn WeedOut Ultra for domestic use, there is no specified application rate per unit area. However, according to Health Canada, end-use products containing 4-chloroindole-3-acetic acid are to be applied to small patches or individual broadleaf weeds as a spot treatment at 4.5 grams of active ingredient per litre. The label provides directions to wet the foliage using short bursts of spray, until foliage is thoroughly wet, but not to the point of run-off. Do not apply to drought-stressed turf or newly seeded turf. Do not apply in very hot ( over 30º Celsius ) or rainy weather, or if rainfall is forecast within the next 2 to 4 hours. Do not water for 2 hours after application. Turf that is accidentally treated may temporarily turn brown but will recover. 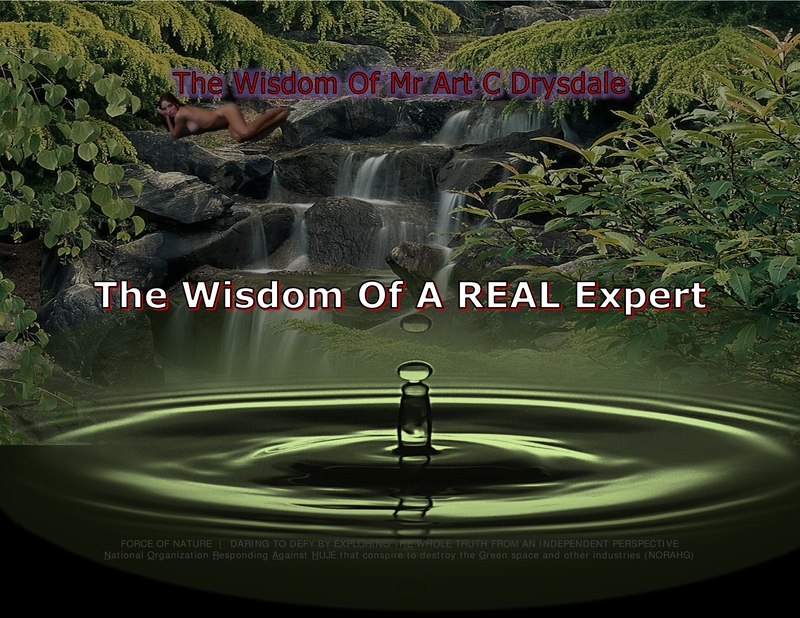 Mr Art C Drysdale is the nation’s best-known celebrity horticulturist, plant expert, writer, journalist, commentator, speaker, and radio & television broadcaster. He is a leading commentator and policy expert on the subject of regulatory affairs and pest control products. He is a REAL expert who has spoken out against anti-pesticide terrжrism, and has publicly stated, in one form or another, that pest control products are scientifically-safe. 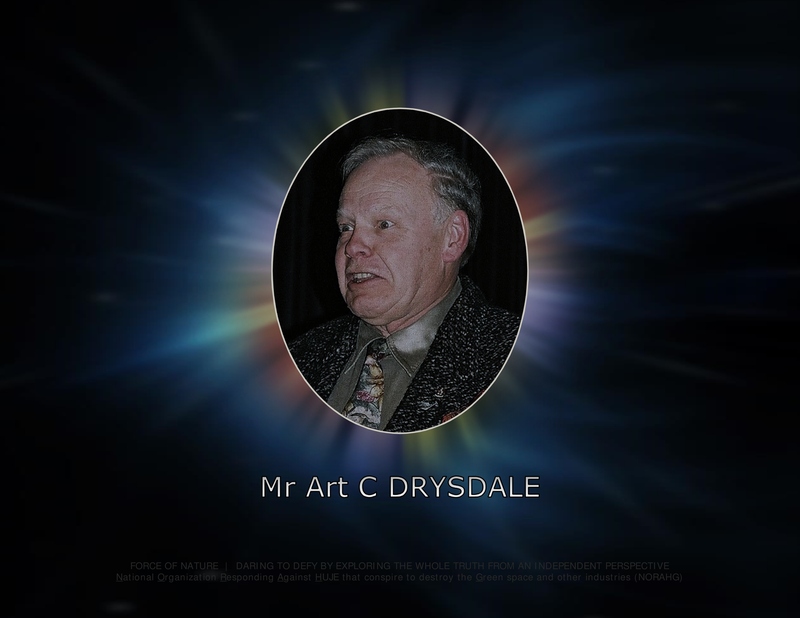 For the past four decades, Mr Drysdale has been writing, and presenting, radio and television broadcasts. He is a world-wide journalist and commentator on the I-Can-Garden Web-Site. Mr Drysdale is also known for his syndicated radio show with Practical Gardening Tips on stations such as CFRB, AM740, and CFCA. In April 2012, Mr Drysdale re-released a NEW EDITION of Gardening Off The Ground, a 168-page book, with 70 sketches, 6 pages of colour photos, including a cover photo of his balcony. Mr Drysdale also converted the book into an e-book, which avoids all the costs of printing, shipping, and handling. 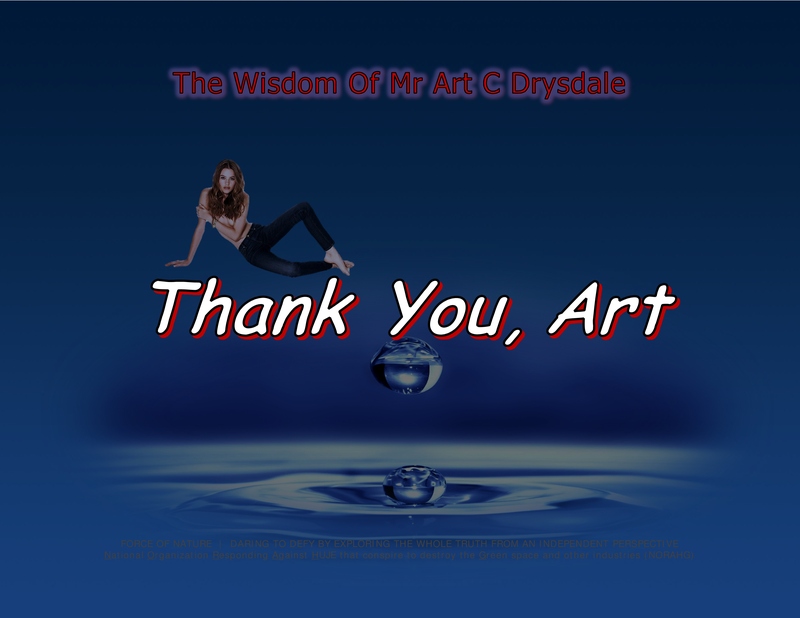 For a copy, simply send Mr Drysdale an e-mail to art@artdrysdale.com OR call this Toronto number 647 977 7507. MR DRYSDALE SPEAKS THE TRUTH FROM AN INDEPENDENT PERSPECTIVE ! We are the National Organization Responding Against HUJE that conspire to destroy the Green space and other industries ( NORAHG ). As a non-profit and independent organization, we are environmentalists who are dedicated to reporting about truth-challenged pesticide-hating fanatжcs ( HUJE ) who conspire to destroy businesses that are dependent on the use of safe and effective conventional pest control products. 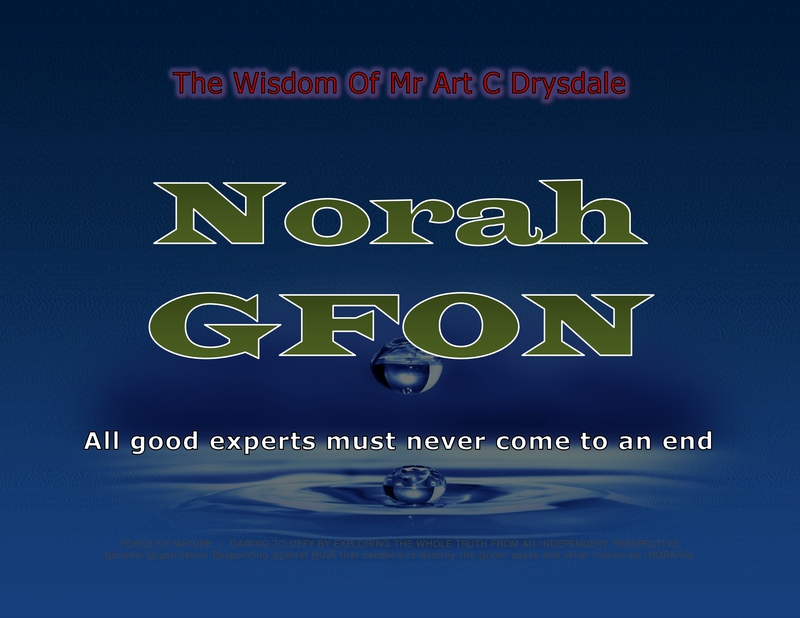 We also report on the work of several highly-rated leading experts, like Mr Art C Drysdale, who have recognized expertise, training, and background in matters concerning pest control products, and who promote environmental realism and pesticide truths. With a Conservative victory in the 2019 Canadian Federal Election, there will be NO NATIONAL PROHIBITION against pest control products. PESTICIDES ARE SCIENTIFICALLY SAFE !